Lac Seul's water has a rusty color, which some people refer to as Walleye Wine. This color of water is indicative of the best fishing lakes in Ontario because it means the water is rich in minerals including calcium and iron. These bodybuilding materials enable fish populations to go grow faster and bigger because their development is not impeded by slow bone growth. That's why Lac Seul is stuffed with millions of Walleyes. 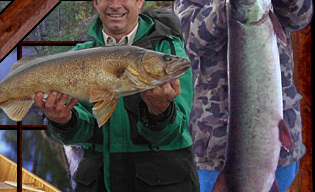 The Walleye Wine water also means you need to adjust your techniques if all your Walleye fishing experience is on a clear lake. In Lac Seul a live minnow on a jig works best because smell and sound are bigger factors than visibility. You can use a 3/16 oz in calm water or a 3/8 oz to 1/4 oz in current. Just use a straight jig with no twistertail. Cast out gently and use long slow jigs so you don't rip your minnow off. When the walleye grabs the minnow, stop pulling and let the fish take the minnow for a couple of seconds and then set the hook. Once you have found a spot where you are catching Walleye after Walleye, you can save your minnows and put on a jig with a Leech or a jig with an unscented chartreuse or white twistertail with a tiny piece if worm or just bare. Salted rubber baits work well but the scented power grubs do not work as well in the north. When you are in a hotspot you don't have to use live bait at all. You can cast lures. If you are casting into shallow water or current, you should go with a shallow running lure like a Original Floating Rapala or a Junior Thunderstick. If casting in deeper water, you can try deeper running lures like Fat Raps, Cotton Cordell Grappler Shad, Down Deep Husky Jerks, Flatfish or what ever you have in your tackle box that goes a little deeper. With jigs the white and chartreuse works best so try to use colors that are bright and visible when selecting a lure. Sometimes the Walleyes get very lazy in the summer, especially if it's a hot sunny day. Use a 1/8-oz jig and put on a minnow or a chartreuse or white unscented twistertail with a tiny piece of worm. Then cast out and literally drag the jig across the bottom. Give it tiny little jigs (2 or 3 inches) once in a while just to shake off any mud or weeds. This bottom dragging gets the Walleyes feeding. It really works. You should always jig slowly. Just make the jig motion longer in the morning, as the Walleyes are more aggressive. You can leave the jig on the bottom for a few seconds between jigs. The Walleyes also hit the jig very softly in this situation. 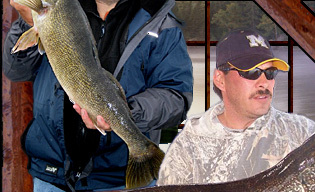 You really have to concentrate on the feel of your rod to know if the resistance is just weeds or if it's a Walleye. 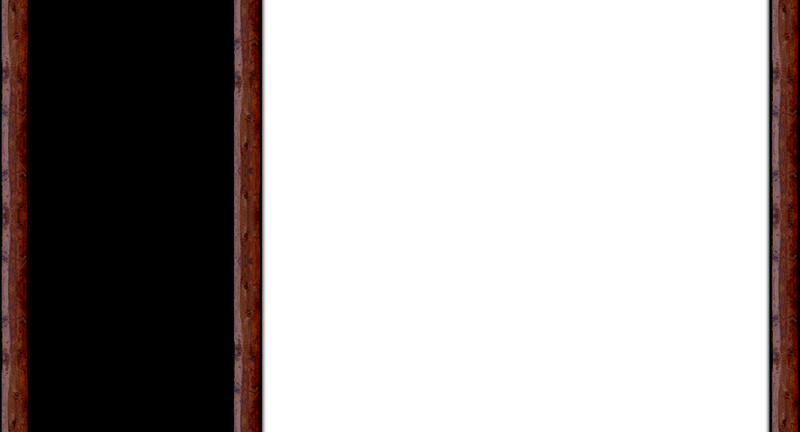 We suggest a stiff yet sensitive rod when doing the bottom bouncing like this. The big trophy Walleyes are almost always female and in the summer or on hot sunny days, they go deep. In a clear water lake they may go 30 or 40 feet deep but in Lac Seul's Walleye Wine water, the big females only need to go 15 feet deep. We are not saying you will not catch big trophy Walleyes in the shallows, it's just in certain conditions it's better to target a different depth if you want to catch bigger fish. The prime areas are drop-offs near sand bars, mouth of narrows, weeds, rocky points and reefs. If you find an area where a spring is running into the lake and there is a drop-off; that is also a prime spot. In this situation you can drift along the drop off with a heavier jig and minnow. If there is a lot of water to cover or the wind is going in the wrong direction, you will have to troll. In this case you want to troll and get down 15 feet so you would want to use deep running lures such as Down Deep Husky Jerks or an Erie Dearie with a minnow, Leech or worm. You can use your shallow running lures and put a weight on the line but splitshots weaken your line and the probability of you running into a big Pike or Muskie is extremely high. There are also environmental concerns. You don't want to use lead unless you have to. We don't want lead present in the food chain. Non-lead jigs are now available at most tackle stores. Trolling with deep running lures or using weights is fine for a lake with a sandy or muddy bottom. In a rocky Canadian Shield Lake like Lac Seul there are rocks on the bottom thus lots of snags. A trick to get deep and save your lures is to troll with a 3-way swivel. You only have to go 15 feet deep so a 1/2 oz weight will be enough to get you down. 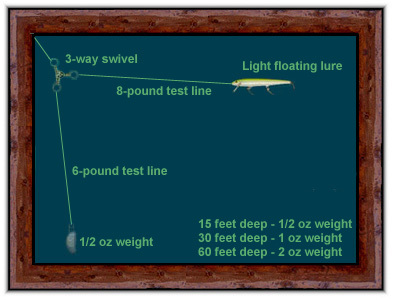 With the three way swivel, use 8-pound test line between the swivel and the lure. Use 6-pound test between the swivel and the sinker. Have the line going to the lure a couple of inches shorter. This way if you get a snag the sinker breaks off and not your lure. With a 3-way swivel, it's best to back troll and move as slow as you can. You only want to move fast enough for the lure to work and no faster. Larger Trophy Walleyes seem to hit slower baits as well. To the right is a picture showing the 3-way swivel diagram.